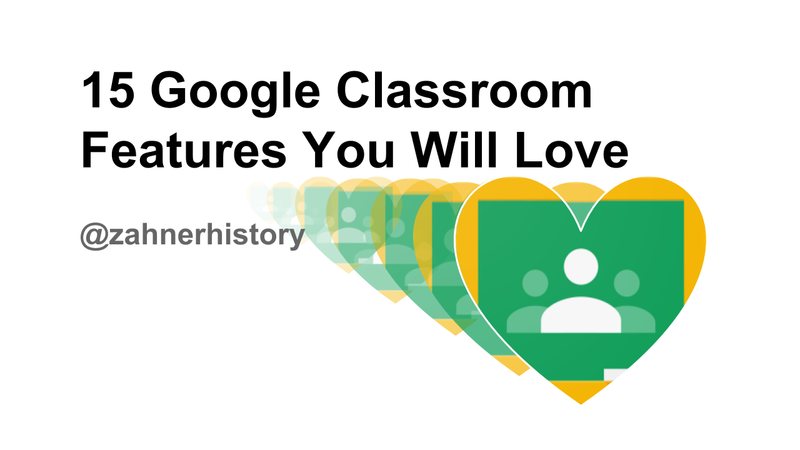 Google Classroom can help you do hundreds of things. I want to show you a short list of what has made my job a little easier after using it for two and and a half years. Lots of updates have been made since the launch in 2014. Some features are more helpful than others, and I get excited about the little things that save time and reduce stress for teachers and students. 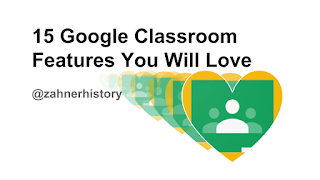 From the start, Google Classroom has been a instructional facilitator. Here's what I'm talking about. Some teachers told me they didn't like Classroom because it was hard to set up. Maybe the concept of Classroom was not well understood by those teachers. Perhaps they weren't primed to explore and learn through discovery, which is so important when it comes to understanding the potential of ... well ... everything. The on-screen directions walk you through set up and provide a tour of key features. For an open mind, this is a piece of cake. Hover over almost any button on pretty much every Google application, and a text box will appear in a couple of seconds to tell you what it does. This may seem like a minor detail, but your students benefit from a special image when they have four or five other classes using Classroom. 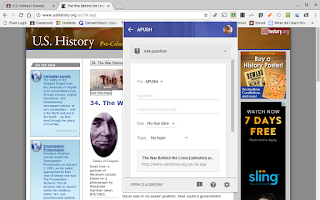 The routine of checking Classroom becomes associated with the header image. I like to make sure that the image is closely linked to the content on a conceptual level. As a history teacher, this means maps, documents, architecture, and other symbols that spark connections to the course themes. 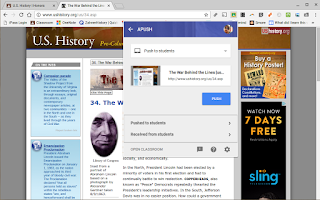 Add resources to the About page that students may need to access throughout the course. I include the syllabus, writing resources, exam prep, and technology expectations. This is the basis of making Classroom in the first place, or at least I think so. As a teacher who used Google Drive long before Classroom was available, I can say that the struggle was real. 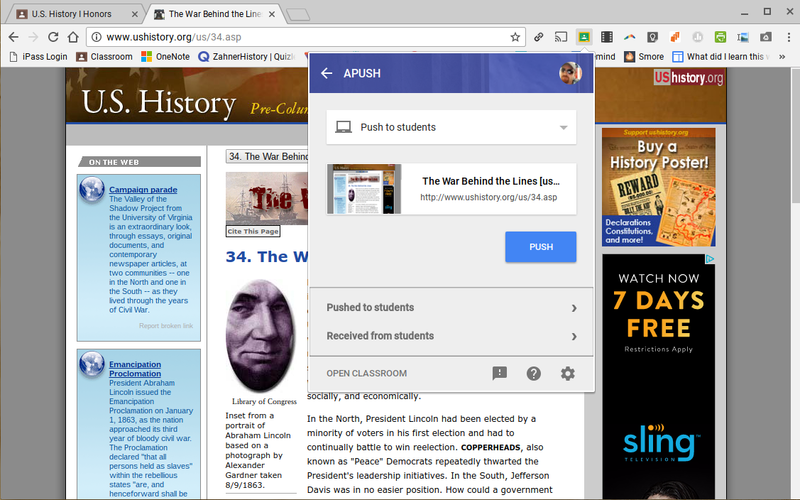 I tried Moodle and Edmodo before switching to Classroom upon its release. The number one reason for this decision was Drive integration. Moodle was time consuming and Edmodo couldn't handle the volume of materials that an advanced high school class needed. Classroom solved a lot of problems in terms of file sharing, permissions, and other workflow issues. I have routines, but I have to work really hard to maintain them. The work comes easy to me at different times and places, so the ability to write out a weekly plan days in advance is great. Most importantly, a post to the stream doesn't have to be posted right away. When posts made too long before students need the information, they freak out because they fail to read the dates on the agenda and start doing the following week's homework. True story. Scheduling posts makes things run like clockwork, literally. I can do my part when the creativity is flowing and productivity is high, and students are not confused over posts that don't pertain to where we are in the lesson cycle. This may sound simple, but time and energy are everything to a classroom teacher. The ability to reuse posts is helpful whether it's from one year to the next or to prepare for multiple classes with similar needs. You can't count on teenagers checking email regularly. They text, so we use Remind to communicate about timely matters. Sharing a link to a stream post in a Remind message is the best guarantee that one of my students will not worry and wonder about to which post I am referring. Let's be really honest. People communicate differently than they did ten years ago. Most of these kids have been texting longer than they've had email addresses. If I can relieve some stress by adding a link to a text message, I'm am happy to take the extra 15 seconds. They're worth it! The story usually starts with a student saying, "I couldn't find it." Shortly after, several other students chime in to confirm the concern. By moving a post to the top, it allows teachers to position an agenda post, for example, to keep the class on track. Sure, kids need to learn to search and find, but teachers also need to reduce stress that comes with technology, especially when students are accessing the information outside of school. The stream can become a mess of posts over the course of a few months. Topic allows users to sort the posts by relevance. For example, I write a weekly agenda, so one of my topics is "00 Weekly Agenda." The "00" ensures that the topic is at the top of the list of topics, which is because the order of topics is alpha numeric. Notice that my unit topics include 01, 02, etc. These topics are for student work like assignments and questions. 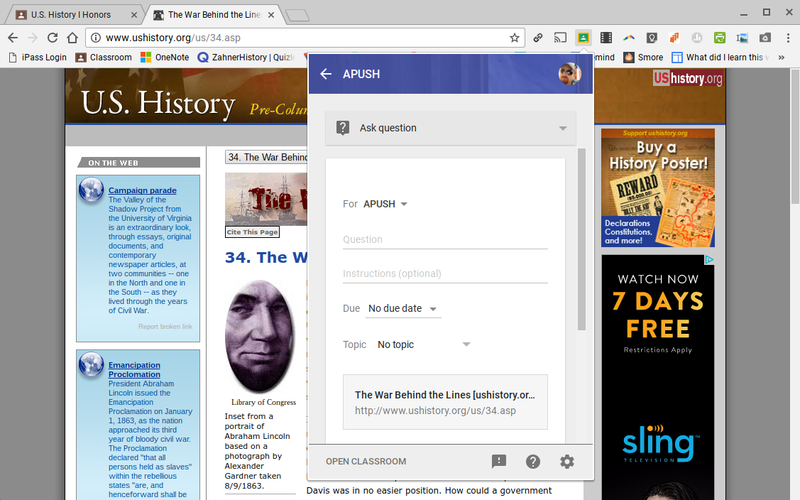 Lastly, I make exam review posts so students can filter the reviews for end of course exams. The post date is automatically added to the top of each stream post. The last edit date is added separately to show students if there were any changes. This is nice because teachers can tell students to look for the agenda posted on a certain date. For students who are absent, the last edit date helps because it gives them more information when they ask questions about the accuracy of the stream posts. We all have so many appointments and deadlines, regardless of the careers we have chosen. Users benefit from the automatic integration of Classroom and Calendar, which is accessible through Classroom. Calendar events are based on the items with a due date. Learning starts with questions, so it's no surprise that Google would include a tool that posts to the stream and updates the gradebook. Last year, my classes routinely responded using the question tool. The question posts take seconds to make and are just as easy to grade. One of the concerns I often hear is that some individuals dislike grading on the computer. Specific concerns range from not wanting to learn the technology to the health risks of screen time. Many concerns stem from the discomfort of change. Many people still like paper because it's what they know, and there's nothing wrong with that. I lost count of how many times I found a website while searching for an answer to a student's question and was able to share it right away because we had the extension. The Classroom extension is as simple as that. It's great for quick transitions. When Classroom was first released, I was working closely with another AP World History teacher. We wanted to share a Classroom and use different sections for our specific classes. This would have been great for sharing resources without bugging each other about what we're doing. We would still bug each other, but the conversations would have been more productive. Last year, I taught a class of 14 students with learning differences. I worked with a co-teacher, and we were able to communicate efficiently because of the option to add Co-Teachers. It's hard for me to try new tools because of the time it takes to get rosters organized and teach students how to access the sites or apps. For many tools, those days are over. The video below shows how quick it is to add a roster from Classroom to a new class in EDpuzzle, a video-based assessment tool.